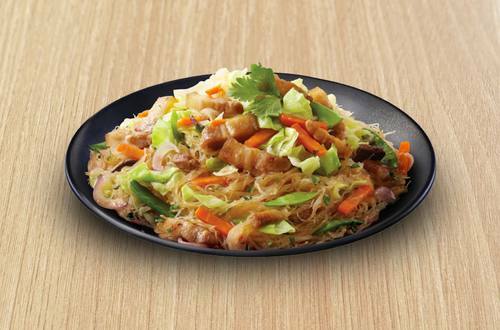 Create our delicious and easy to follow recipe for Pancit Bihon with Knorr SavorRich Pork Liquid Seasoning! 1 Boil pork in 1/4 cup water for 10-15 minutes or until water dries up. 2 Add oil in pan then saute pork until color turns brown. 3 Saute onions and garlic in pan until tender. 4 Add chicken liver. Saute until fully cooked. 5 Add carrots, chicharo, cabbage and kintsay. Saute for 1 minute. 6 Add water, soy sauce and Knorr SavorRich Pork Liquid Seasoning. Mix well and let broth simmer. Season with pepper and salt according to taste. 7 Drain meat and vegetables from stock and transfer on a bowl. Set aside. 8 Add noodles in simmering stock and let cook until tender while stirring once in a while. Let noodles absorb the stock. Once noodles are tender transfer on serving platter then top with cooked meat and vegetables. Serve immediately while still warm.